In this tutorial I share details on how to create a Page Template in Genesis that uses MixItUp for creating a fluid, multi-column, percentage-based grid of Posts filterable by sub categories of a specific category. 4 columns per row will appear at desktop widths, 3 at 960px and below, 2 at 568px and below and finally 1 at 320px and below. The number of columns that appear at a specific width or media query can easily be changed in style.css by specifying the width in % (25% for 4 columns, 50% for 2 columns and so on). Each Post is set to display its featured image if present and a default image if the Post has no featured image, linked title and linked categories. hook a function to genesis_after_loop to add gap elements which fill any potential empty spaces, and ensure all grid items are spaced consistently. Add custom CSS for setting up Inline Flow grid. Thanks for taking the time to write this tutorial. I was wondering if you know why the posts’ content might not show up in the grid? At the moment, on the site that I’m building, all I can see is the filter tabs but none of the blog posts’ content? I had to change the category ID in the page_blog.php file to get the filter to work in my theme (Parallax Pro). Is there something else in the file that I should consider editing? Replace recipes in line 70 with the slug of your parent category. I have updated the tutorial (instructions below code block in Step 3 to be specific) accordingly. Thanks Sridhar, I’d already used ‘recipes’ as the parent category so although it had a different ID, the slug didn’t need changing. I’m thinking it has something to do with the Parallax Pro theme. Are there any general settings that you think might be affecting this? For example, does the Posts Page need to be set in Reading Settings? I had the same issue until i realised i had to add another script referenced on line 20 of the “page_recipes.php” template. I have updated the tutorial accordingly. Would it be possible to add custom post types into the loop below, if so could you show an example. I have a few examples on displaying filterable entries of a CPT on this site, albeit with Isotope, not MixItUp. category ID and slug as detail above, or would it involve more? Are these categories a custom taxonomy or the standard WordPress categories? Do you want to filter CPT entries by the standard (built-in) WordPress category taxonomy? Can you describe what you are trying to do? Thank you for this great tutorial, it is working great. One question, is there a way to display also post excerpts under each thumb? Try removing http://pastebin.com/raw.php?i=p54euyER from page_recipes.php. Thank you very much Sridhar, it worked like a charm. One more question please. 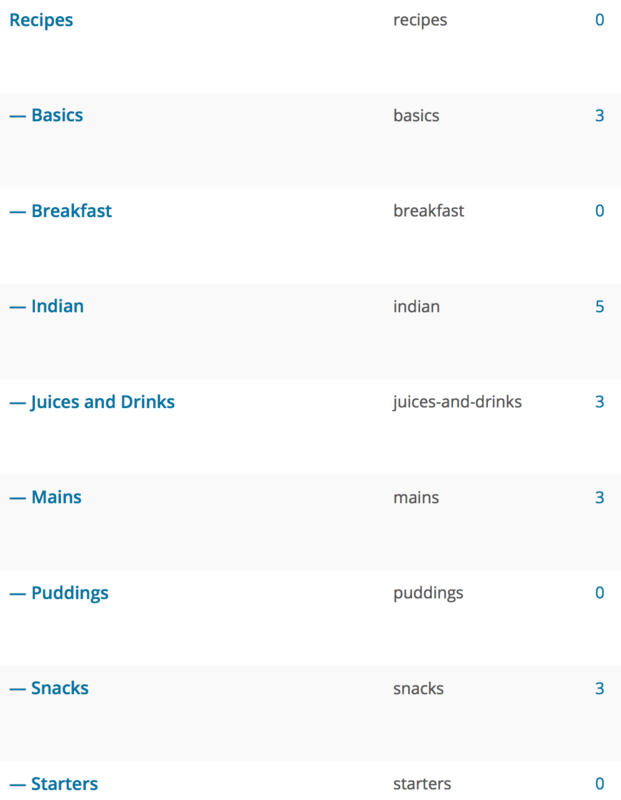 Is it possible, from another page, to link to each category contained in Recipes page, and get only the posts that belongs to that category on the recipes page? For example, from the front page I would like to create a link named Juices and Drinks and point it to Juices and Drinks contained on the recipe page, but I am not sure how to configure that link. Would you be so kind and let me know how can I achieve that? I would really appreciate if you can guide me on that. How do the same but instead of subcategories, filter the categories themselves? Yes, just like this! Thanks. Awesome tutorial! I there a way to a) have some content in my page under the main title before the filterable items? and b) have it so that when the user hovers over the sub category image the title & portion of excerpt can display? 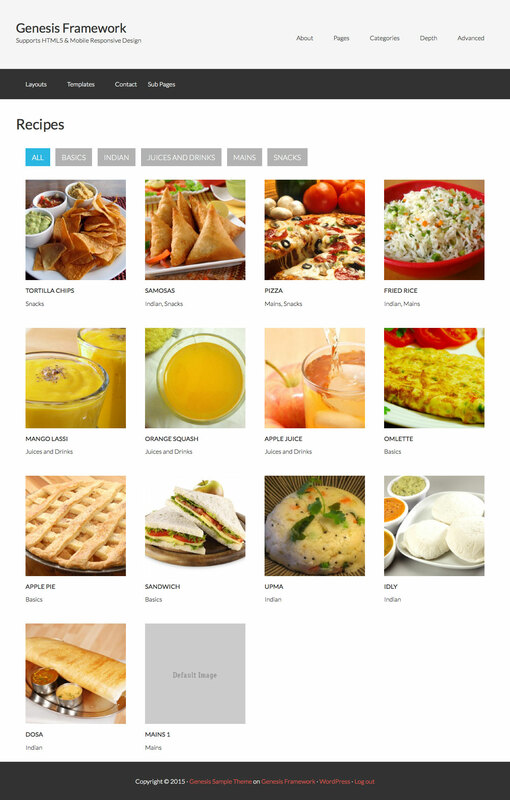 I was looking at this other tutorial of yours but wouldn’t know how to tear it apart for that function (https://sridharkatakam.com/filterable-portfolio-grid-in-altitude-pro-with-title-and-excerpt-appearing-on-hover/). Thanks! I have updated the tutorial and provided code changes in addendum 1 near the end. I’m wondering why the categories are not appearing under the entries on http://spokesman-recorder.com/913005-2/. I don’t know if this makes a difference but I’m using a Gravity Form and Post Fields to create the post content. The theme is Magazine Pro. I need this same result but for a custom post type of Projects. – What are the main differences? – Is there another tutorial for CPT? – How would the category nav work since it’s not subcats of a parent cat? – Shouldn’t I use an archive-ctp_name/php instead of a page tempalte? Also, I need initial load to be a specific category, not All. I know how to remove the All button, but I’m having trouble getting just one category to show on initial load. You could write a few lines of jQuery to click on your desired category after page load so it is active. You can set up filterable feature of any post type using Isotope or MixItUp or my current favorite, FacetWP. For an example of FacetWP method, see https://sridharkatakam.com/portfolio-grid-genesis-filterable-multiple-taxonomies-using-facetwp/. This tutorial shows how to filter by multiple taxonomies. You can also filter by a single taxonomy and have the terms appear in a row with CSS. Thanks Sridhar! I got it working after I posted my comment. But now I’m having trouble figuring out what part of your code actually outputs the post titles? Because I need to output a custom field value right below each post title. You could put that code inside a function hooked to genesis_entry_header inside page_recipes.php. Thanks so much for the great tutorial! Is there a way to limit how many of these pull and add pagination to it? I see the code mentioning posts_per_page but when I edit that number the pagination displays but goes a bit awry. Currently using it on a site with a LOT of recipes and would love to ease up the load time. * @param array $classes existing post classes. Are you after multiple select menus (dropdowns) like the one at http://my.studiopress.com/themes/?